Blood in poop? • Bearded Dragon . org . Should I take him to the vet? I'm not worried about impaction, he goes every day and doesn't ingest the sand in his enclosure (the sand in the poop is from me dropping it). There are three minor diet changes that I'm worried about. I may be feeding him more carrots than I should. They come shredded in the bag of field greens I buy. Also, I fed him a johnny-jump-up yesterday (whole flower head) and I'm worried that might have been to dense for him to digest properly. And I might have been feeding him too much romaine. It also comes in the bag of field greens, which I bought because it has endive and radicchio in it. But I can't tell the difference between the endive and the romaine, so I can't pick it out. Lastly, I fed him a few dandelion flowers, and I don't know if I should be worried about that or not. I'm sure that the plants I find outside are pesticide free, because I live in a very small neighborhood. Should I wait until tomorrow to see if his poop still has blood in it? Other than the blood he seems perfectly fine. Bright eyes, round body, and clear skin. He likes to walk around a lot, and often when I pick him up he is warm to the touch. He even soaks in his water bowl voluntarily. His belly did have black spots on it all morning, but after he pooped and I fed him, he seems happy. What to do? I'm keen on waiting because I don't have a lot of money, but I will take him to the vet if I have to. 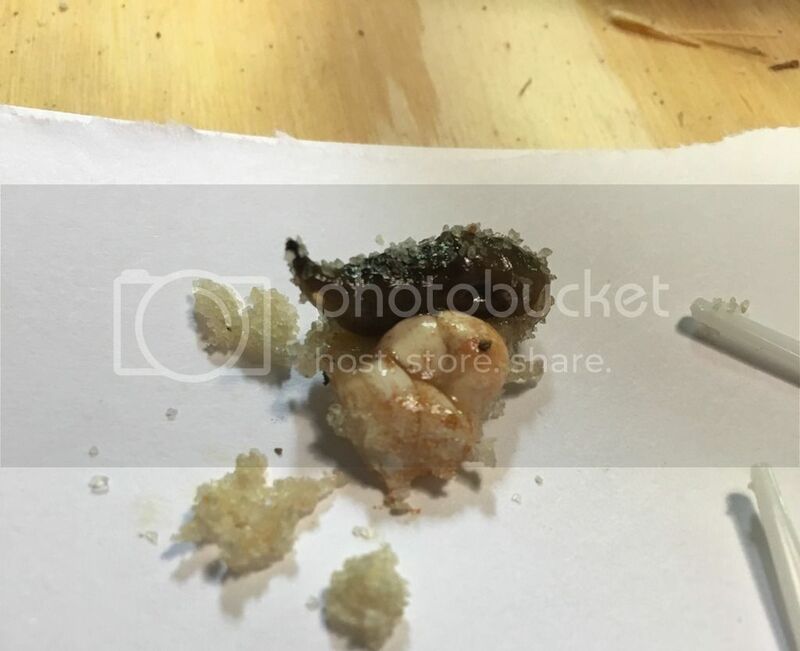 I was worried about the sand in the photo, but if that's all from after the poop was laid then that's good. Keep in mind that the sand may harbor bacteria from the poop if not cleaned well though. The poop looks pretty good overall. The color is likely from the food rather than blood. Sometimes they can strain a bit if they are dehydrated which can also introduce a bit of blood to the poop/urate. I suggest for now just offering drops of water on his nose to lick up and make sure he's well hydrated. Keep a close eye on it for the next couple of weeks and look at poop color and formation along with excess water passing through with it (this is usually good). Since he's eating well and is active, I wouldn't worry about it too much at this point though. as well like vitamins, etc. Were the urates hard or soft? towels, textured slate tile, or reptile carpet are all good choices for substrates.